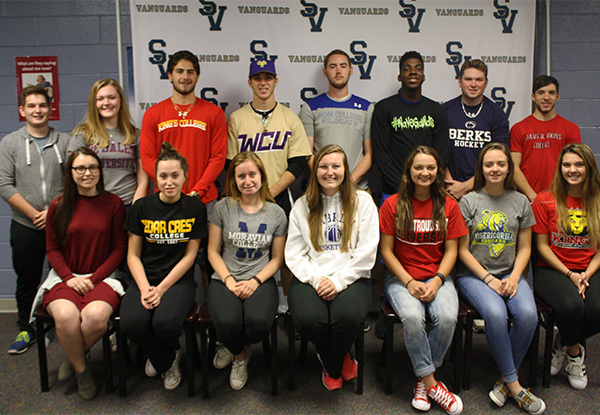 Sun Valley held its annual College-Bound, Student-Athlete Recognition Day Wednesday at the high school. Pictured are the following student-athletes headed to the next level to continue their academic and athletic careers. Alyssa Madden will be playing Tennis at Cabrini University while majoring in Physical Therapy. Devyn Crowder is attending Cedar Crest College where she’ll be participating on the Volleyball team. She’ll be in their Nursing program. Natalie Novotni will be participating in the Nursing program at Moravian College while running Cross Country and Track. Kate Lannon will be attending Cabrini University to play Basketball and earn a degree in Elementary Education/Special Education. Mackenzie Lewis is planning to play Softball for East Stroudsburg University while studying Exercise Science for her major. Madison Skwirut is attending Misericordia University where she’ll be participating on the Swim team. Her major will be in Medical Imaging & Sonography. Bailey DeLellis will be playing Field Hockey at King’s College while double majoring in Finance and Accounting. Jake McDonald is attending The King’s College in New York City where he’ll be participating on the soccer team. He will be majoring in Business Entrepreneurship. Ryan Vickers will be majoring in Biology at DeSales University while participating on the Volleyball team. Christian Bateman will be playing Baseball at West Chester University. His major of study will be Health & Physical Education. Brendan Skwirut will be majoring in Residential Construction Technology & Management at Penn College of Technology. While there, he’ll be participating on the Soccer team. Ishy Ahmad will be attending King’s College and a member of their Football team. Casey Crockett will be playing Ice Hockey for Penn State-Berks while studying Kinesiology for his major. Austin Campbell is planning to attend Davis & Elkins College and major in Exercise Science. He’ll also be a member of their Lacrosse team. Owen Parente will be attending Penn State-Brandywine to play Soccer. His major is currently undecided.